or through the affiliation of those who serve them as leaders. If you are looking for an inclusive Catholic community near you, Catholicism Moving Forward is a Ministry of the Ecumenical Catholic Diocese of New England that may be of help to you. If you are a displaced community or group of Catholics searching for a priest we may be able to connect you to a Roman Catholic Womanpriest or married priest near you. If you are seeking to form a small Eucharistic Community and seek help or advice in doing so we have experienced people who can help. To learn more contact us with a brief email explaining your situation and someone will be in touch. Evensong Ministries, located on Cape Cod and formerly known as Evensong Retreat Center, now offers a variety of ministerial services to residents and churches of Cape Cod and beyond. 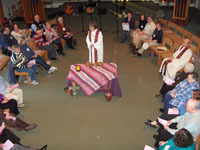 Preached on-site retreats for church communities, spiritual direction for individuals, Reiki treatments and training, and ceremonies for important life transition moments are among the ministries offered. Evensong Ministries provides pastoral services for St. Mary of Magdala Ecumenical Catholic Church on Cape Cod. Revs. Marie and Jim David are the senior partners of Evensong and are happy to meet with church groups or individuals to explain our programs or to design a special program of services for you. Contact us at 508-737-1899, or email Jim or Marie. Rev. Charles Cavalconte and Rev. 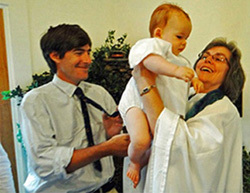 Cheryl Cavalconte are available to celebrate the Sacraments with people in the Southern New England area. They have an active ministry of baptism, funerals, retreats, and spiritual direction. 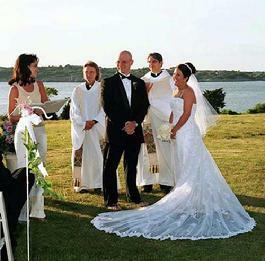 They also officiate at weddings (see below). Sanctuary of Peace is a Eucharistic community that meets on the first and third Sunday of the month (11:30 AM) at a member's home in the Mount Airy section of Philadelphia. We began in 2005. We consider ourselves a "house church" and average about 12 - 20 people who break open the word (we follow the Lectionary) and share a common Eucharist. Liturgical leadership rotates among interested members. Contact person is Joe Clay at jvfc3@msn.com. Rev. 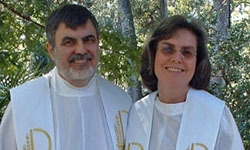 Dr. Carl Yusavitz, an ECDNE priest, is one of the liturgical leaders. Spirit of Life Community is a community of worship and service, where Justice and Joy are prominent themes. Unconditional welcome is the driving force of this community. Everyone is invited to come as they are, knowing that they are included in the Circle of God's Love. It is a safe place where Catholics can explore their spirituality without fear of judgment. All members of Spirit of Life are icons of God’s love for one another. Our commitment is to help each other grow into all that God is calling each of us to be. 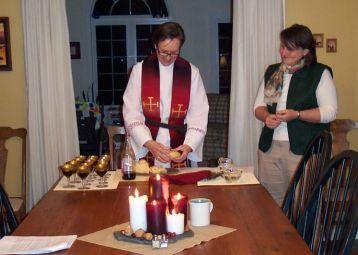 Liturgy of the Eucharist is celebrated at 5pm each Sunday, at the Congregational Church of Weston. Rev. Jean Marchant and Rev. Ron Hindelang serve as co-pastors to the Spirit of Life Community. To learn more about Spirit of Life Community click here. St. Mary of Magdala Church is an inclusive Catholic Community located in Harwich Port, MA on Cape Cod. It is Catholic in its heritage and worship, while ecumenical in its makeup and outreach to the wider community. In its mission statement the community declares its call to "Gather for worship, cherish our living Catholic Tradition, witness the Gospel, and minister to others as Christians in the world." Like its sister community of Spirit of Life, a foundational value for this Church is that all are welcome. Rev. Marie David and Most Rev. Jim David serve as co-pastors. St. Mary of Magdala Church gathers for worship at 4:00pm each Saturday at St. Peter's Lutheran Church in East Harwich, MA. For more information click here.